“I’m excited to lead the Pursuit program because I’m passionate about people growing through new experiences,” says program director Randy Krahn. 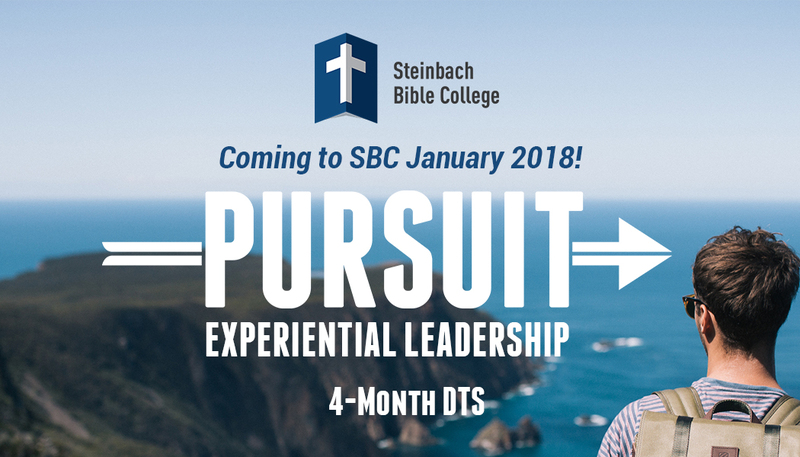 STEINBACH, Man.—Young adults have a new discipleship school option as Steinbach Bible College launches its Pursuit program in January 2018. Pursuit features two mission trips, a focus on experiential leadership development, and a lighter academic load than regular SBC programming. Randy has a BA with a focus in youth ministry and 10 years of experience in camp and youth ministry. He brings an excitement for Jesus, people, and outdoor adventure to the Pursuit program. Katelyn Troyer serves as assistant director. With the first cohort starting January 2018, Pursuit is a four-month program (January through April) for young adults who desire to pursue God through travel, leadership experiences, discipleship, worship, community, and mission. Pursuit extends the weekly experiential learning components to include urban and international ministry experiences, including in Guyana (two weeks) and internationally with Mennonite Disaster Service (seven to 10 days). Steinbach Bible College’s campus serves as Pursuit’s base-camp, grounding the program in experiential learning, biblical instruction, and life-on-life mentoring. Pursuit will help young adults grow confidence, purposefully explore the world, build life on the richness of God’s Word, and servant leadership ability. Participants will study the Bible, worship together, pray, serve, build friendships, and seek God through devotional God-times. For information, contact SBC at 204-326-6451 or info@sbcollege.ca.